Robert Erwin of Indian Lake poses with friend and caregiver Glennia Milonich. A local man is fighting to stay alive and desperately needs a kidney transplant. 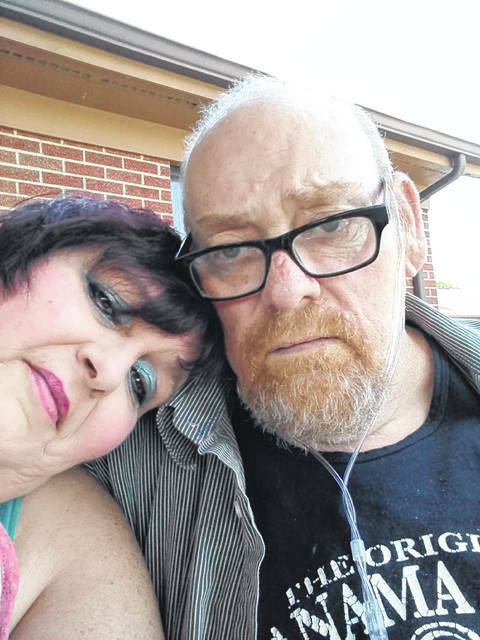 Robert G. Erwin, who is 60 years old and a resident of Lakeview, has had a run of bad luck with a recent heart surgery. His kidneys are now not functioning. He is hoping someone will step forward to donate a kidney. “Right now he should be dreaming of riding his motorcycle, going fishing, taking trips and participating in car show charities for children’s hospitals and St Jude, which are his favorite things to do,” said friend and caregiver Glennia Milonich. “But instead, he is just hoping to stay alive. A kidney transplant is his only chance for survival,” she adds. Erwin is on a transplant list and is registered with the the Ohio State University Wexner Medical Center to take a transplant class in March. Erwin, who has lived at Indian Lake for over 30 years, is now on dialysis for over four hours a day, three days a week. “He is not doing well and is fighting to stay alive,” said Milonich. “He is in end-stage renal failure. A living donor is his only chance for survival. Erwin has a positive blood type, but a negative blood type does not necessarily exclude someone from donating a kidney,” explains Milonich. Milonich said potential donors could call her directly at (937) 935-5706. You may contact OSU for information on living kidney donations at wexnermedical.osu.edu/kidneydonor.